Welcome to our DYNAMIC x200 Server ! Many things have been changed, fixed, removed or added since we opened our first server. Starting from item drop till Golden and other monster bosses strenght, and PvP and PvM damage. players can more concentrate for in-game drops/in-game items ! max stats is not available to get, which makes game more interesting, more info you can see down below ! Also just made Updates #4, more info about updates can find @ Forum ! NEW Client is added @ Downloads and is required to play ! Objects + Luck increase the probability of success by 20% ! Referral link can be found by going to account panel section. The Party Bonus system gives you more experience if you make a party of 5 different classes, including 3 base classes. As a race is added to the party, the extra experience is increased a little bit more. Do not forget to read the rules, join our facebook page, invite friends and start vote now every 12h to get Free Credits ! More information about server, guides, tutorials, updates and other things can discuss at our Community Forum ! www.muonlines.net - DYNAMIC x200 GRAND OPENING TODAY (3 MARCH) in 2 hours !!! First Castle Siege period has been started in DYNAMIC x200 MuOnlines Community ! 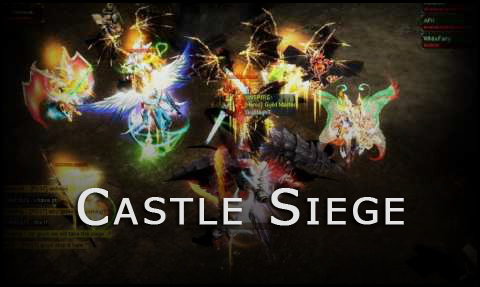 Castle Siege registration period is started, TODAY is the last day to register your guild - don't be too late ! This is the final time to start look up for new guild members ! Try to make the strongest Guilds and Alliances as it's possible to WIN Siege and get opportunity to get in Lot of Trials ! MEDIUM x500 OPENING 7th APRIL - JOIN US ! www.MuOnlines.net - MEDIUM x500 Server OPENING TODAY 7th APRIL - Join US !